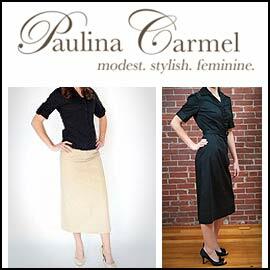 Paulina Carmel DeCastro is a designer whose website features hand-picked modest clothing from around the United States. De Castro is also developing a signature line of modest clothing. The website seemed to offer only a couple of dresses at the time of our visit, but there were several skirts, ranging from a lightweight denim pencil skirt to a "classic" khaki skirt. De Castro's focus is modest attire. Every item displayed may be considered modest, from the length of the skirts to the sleeves on the dresses, and all of the items that we saw were also stylish and modern. It's worthwhile to take the time to click on the website's FAQ button, and then to read De Castro's thoughts about modesty.